What did cerdd dant sound like 500 years ago? It’s almost impossible to imagine! The earliest recordings of cerdd dant, or penillion singing, come from the beginning of the twentieth century – and even those recordings sound quite different to the way cerdd dant is sung today. On paper, no record exists of a cerdd dant ‘setting’ or counter melody (gosodiad) until 1839, in The Welsh Harper by John Parry (Bardd Alaw) – but we cannot be sure that what appeared here accurately reflected the oral tradition at the time. We can, however, be sure of one thing – that singing of some kind to harp accompaniment goes back a very long time, perhaps as far as the time of the Druids. 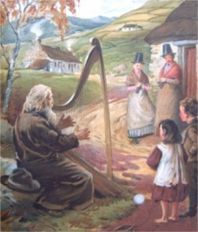 Other people apart from the Celts had harps, of course, but over the centuries one essential element became important in Wales which would make the art of singing with the harp different: the special relationship between poetry and music. Cerdd Dant is essentially a means of performing poetry, and the words are always given the greatest priority. (It is thought that, for a long period, the harpist and singer were one and the same, but by around the early middle ages the two arts had been separated. 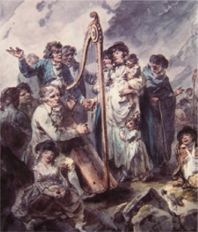 A depiction of a Welsh harpist by J.Michael Brown which appeared in the 'Cambrian Minstrelsie' (Alawon Gwalia) – a collection of Welsh melodies edited by Joseph Parry.